Lately I've put our apartment on the design back burner. Mostly due to the fact that we were (are?) seriously considering moving to a house, and don't want to make any major purchases if we're moving, and also because for the most part, our apartment is in a pretty good place right now. Sure, there are a million things that I'd love to do, but I'm trying my best to be realistic and practical. Bed: we're still rocking the no headboard bed on wheels look, which I'm not into. And while I would love to go splurge on a luxurious tall upholstered headboard, the realist in me is thinking about storage bed frames. While our apartment is spacious and we do have 3 decent sized closets, we're constantly looking for more space to put stuff (suitcases, bags, pillows, etc. 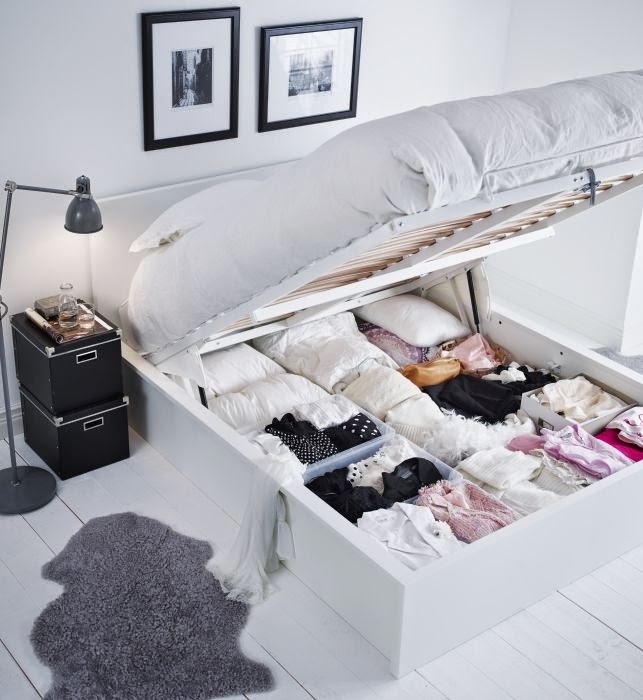 ), and the most logical solution is a storage bed. Mostly there are options that allow you to utilize the entire space under bed frame by lifting up the mattress (above), or options that have drawers built into the frame (below). Both options are Ikea. The above is a new stain they have that mimics the white oak look (which I am in love with). 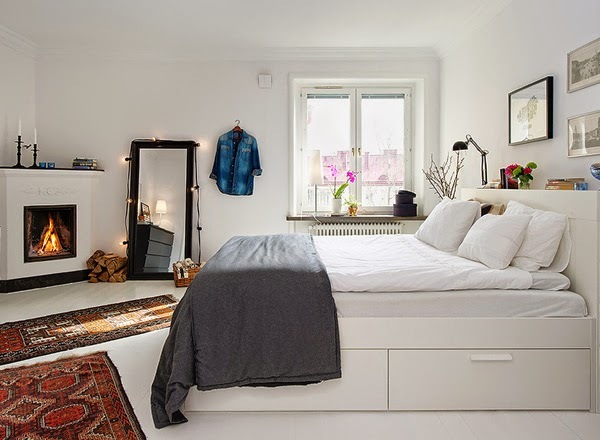 I'm leaning towards the clean white bed frame in order to utilize more storage space, and not to clash with our mid century modern brown dresser. Bedding. 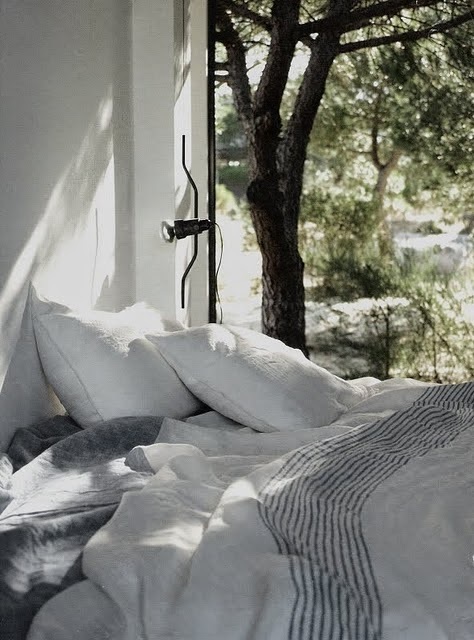 Going for that doesn't have to be perfect made/unmade look, which means a linen duvet/bedding is a must. H&M home has a really inexpensive linen duvet that we wound up buying, and it only gets softer with each wash/dry. I was having some serious frustrations about how the bed was looking when I wasn't the one making it, and came across this new bedding concept (or normal bedding concept if you're European) from a company called Parachute Home. After reading up on the company, we decided to get rid of our top sheet which makes it way easier to make the bed and totally changes the way you think about bedding. I mean, who needs a pesky top sheet anyways? 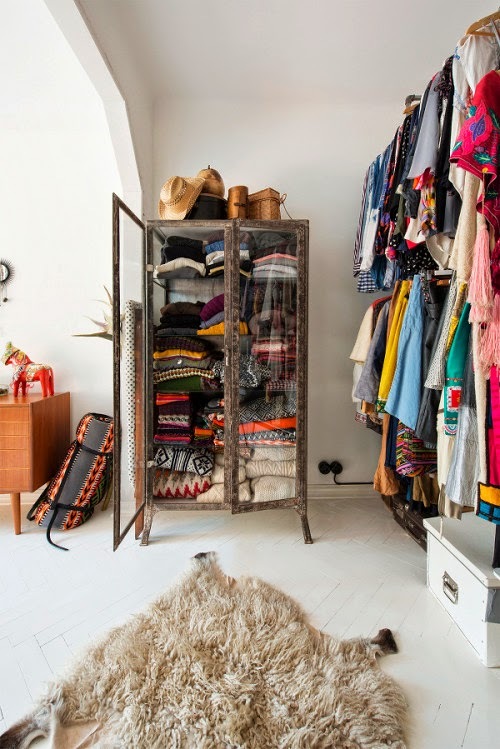 Other wishful bedroom ideas include a metal/rusty glass door cabinet for my off season (or on) clothes, new artwork, a rattan chair, sconce bedside lighting, and a pony. Just kidding. Sort of. What practical improvements are you looking to make at home?